Last time, we shared the first installment in this series called Baby Behavior around the World. We featured differences in the key caregivers of infants and children within several different cultures. Of course, any discussion of caregivers must include parents! In this post, we'll share what we've learned about how mothers' and fathers' roles have changed within the United States and beyond. In the U.S. and other countries, many caregivers are facing the challenge of balancing career and family life in these tough economic times. Increasing numbers of U.S. mothers with young children are working and statistics show that 55% of mothers with a child under 1 year old work, compared to 31% in 1976. These changes force moms to seek alternative methods of childcare with grandparents, neighbors in the community or childcare in homes or centers. Other Western countries show similar findings. 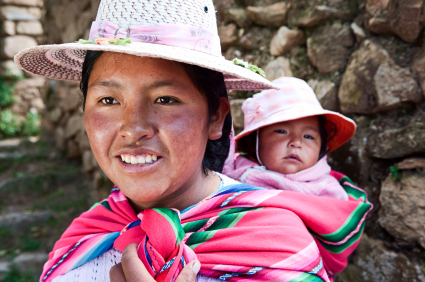 In the majority of developing countries, mothers are responsible for childcare. In Nepal, working mothers in urban areas have less support from extended family than those in other areas. One study in Nepal found that working mothers relied more on their own older children (mostly girls) to care for their younger siblings. Among families who had an adult (non-mom) care for their children, the husband was the most common caregiver, followed by mothers-in-law and neighbors. On the other hand, non-working mothers were more likely to live in extended families and depend on other adults living in the same household to provide childcare. The role of father as primary caregiver has changed considerably over the past several decades, and research shows that today’s dads are committing more time to caring for their children than their own fathers did when they were growing up. In past posts, we discussed the changing role of fathers in the U.S. in their children’s lives and the growing number of stay-at-home dads, but is the role of “father” changing in other countries as well? Different cultures continue to instill fatherhood with different meanings. For example, in West Africa, fathers have little paternal involvement, but work to create their children's future social status by establishing social connections within their clan. Mothers and fathers of the Aka hunter-gatherers (of Central Africa) show an equal amount of affection and care for their infants while in some Brazilian communities, fathers are idealized as disciplinary, authoritative figures whose main role is to provide financial security. Studies do show that times are changing as the role of fathers is influenced by educational efforts (http://fatherhood.gov/ and http://www.fatherhood.org/) and increasing urbanization in developing countries. The role of caregiver has been played by many different supportive friends and family members as my daughter Lily now reaches the age of 4. I was lucky enough to stay home for her first few months of life and when I returned to work, my sister-in-law cared for Lily as I worked part-time. Loving mothers continued to enter our lives and play a key role in caring for our little girl. Changes in the economy led to my husband’s current role of stay-at-home dad (probably the most challenging job of his life!) Long story short; it’s true; it does take a village to raise a child, even in the United States. 1. Rasmussen, S. Children Dynamics: Anthropological Insights. Culture and Psychology. 2009;15(4): 433-449. 2. Morello, Carol (2010, Sept. 9). Grandparents increasingly fill the need as caregivers. Retrieved from http://www.washingtonpost.com/wp-dyn/content/article/2010/09/09/AR2010090904076.html, 19 May 2011. 3. Hawkes, K. Human longevity: the grandmother effect. Nature. 2004;428:128–129. 4. USAID for the American People. Grandmothers: A learning Institution. Prepared by Judi Aubel, PhD., MPH, The Grandmother Project. August 2005. 5. Engle, P. Fathers’ Involvement with Children: Perspectives from Developing Countries, Social Policy Report. Society for Research in Child Development.1998;Volume XII, Number 1. 6. Golden, AG. Fathers’ Frames for Childrearing: Evidence Toward a “Masculine Concept of Caregiving”. Journal of Family Communication. 2007;7(4):265-285. 7. Bureau of Labor Statistics (2011, April 18). Labor Force Statistics from the Current Population Survey: Earnings by demographics. Retrieved from http://www.bls.gov/cps/earnings.htm#demographics. 8. Nakahara S, et al. Availability of Childcare Support and Nutritional Status of Children of Non-working and Working Mothers in Urban Nepal. Am J Hum Biol. 2006;18(2):169-81. Baby Behavior goes to Los Angeles!